Spray 3 1/2- to 4-quart slow cooker with nonstick cooking spray. Layer 3 tortillas in bottom, overlapping. Top with half of the chicken, half of the ham, 1 can of the chiles, the great northern beans and 1/2 cup of the cheese. Pour 1/4 cup of the broth over layers. Repeat with 3 more tortillas, remaining chicken and ham, 1 can of the chiles, the kidney beans and 1/2 cup of the cheese. Top with last 3 tortillas, remaining 1 cup cheese, can of chiles and 1/4 cup broth. Cover; cook on low setting for 6 hours. 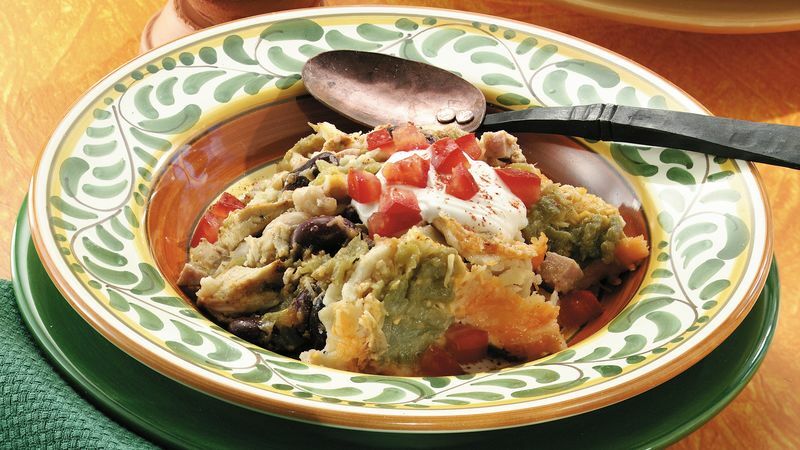 Top off this casserole in the full Mexican style. Offer sour cream, chopped tomatoes, guacamole, salsa, shredded lettuce, sliced ripe olives and sliced green onions.